When we started making the Dubby in the mid ’80s, we wanted to make as versatile a product as we could, so we made the jig so the platform would be trimmed on the table saw during set-up. For many years, the “standard” Dubby would fit about 95% of the saws on the market, as the distance between the miter grooves and the saw blade on most saws was between 4″ and 5 3/4″. If your saw has distances from the miter groove to the blade between these two dimensions, you will be able to use our “standard” Dubby. In recent years, there have been a few saw manufactures who have designed saws on which the distance between the miter groove on the saw and the blade can be either “less than 4” or “more than 5 3/4”. If your saw is in this category, you will need “custom” platforms with your Dubby. To order a “custom” Dubby, we ask that you call us directly at 508-949-2968. We do have a small “upcharge” for these special jigs due to the extra work involved. Delivery of the Dubby may take longer, depending on platform availability. 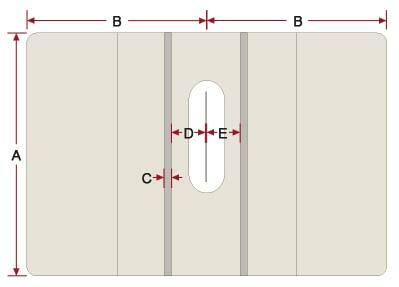 The illustration shows the measurements that you should make before ordering so we can insure that you will receive the Dubby that will work correctly on your table saw. We recommend you record these measurements to simplify the ordering process. This measurement must be at least 27″. If this dimension is less than 27″, the table saw top will be too small to safely support the Dubby platform. Under some circumstances, adding a rear support table to the saw top may solve this problem, but you should contact us to verify it would allow you to install the Dubby on your saw. This measurement should be at least 19″. You must insure that the Dubby platform will not overhang the outside edge of the extension. The miter grooves on the saw should be 3/4″ wide and 3/8″ deep. The grooves may be slightly undersize or oversize, as our adjustable/self-adjusting bar will accommodate these variations. For “standard” Dubby orders this measurement should be between 4″ and 5 3/4″. If this measurement is not between these measurements, you will need a “custom” Dubby. Note: If either the D or E dimension is not within the dimensions listed, and you are ordering the “Double (both sides) Dubby,” you should order “custom” units for both sides. This will insure the platforms will match in thickness so you can join the jigs together.